Is Obesity The Government's Business? In the U.S., more than 78 million adults and 12 million children are obese, prompting some to argue that it's in the government's interest to combat the problem. But others say the government should stay away from people's personal habits. A group of experts takes on the topic in the latest Intelligence Squared U.S. In the United States, more than 78 million adults and 12 million children are obese, prompting some to argue that it's in the government's interest to develop a strategy to combat the problem. Obesity is associated with an increased risk of serious health problems, including diabetes, heart disease and cancer — adding costs to the nation's health care system. Despite that, others argue against government intrusion into people's personal habits. And some contend that the government doesn't know how to achieve its aims anyway. A groups of experts came together to argue about the obesity epidemic in the latest Intelligence Squared U.S. debate. They faced off two against two in an Oxford-style debate on the motion: "Obesity Is The Government's Business." Dr. Pamela Peeke, WebMD's chief lifestyle expert, and Dr. David Satcher, former U.S. surgeon general, argue in support of the motion: "Obesity Is The Government's Business." Dr. Pamela Peeke, WebMD's chief lifestyle expert, is a physician, scientist and expert in the fields of nutrition, metabolism, stress and fitness. She is a member of the Maryland governor's Council on Fitness; a Presidential Challenge advocate for the President's Council on Fitness, Sports and Nutrition; and is national spokeswoman for the American College of Sports Medicine's Exercise is Medicine global campaign. Peeke is also chief medical correspondent for nutrition and fitness for Discovery Health TV, and the author of Fight Fat after Forty, Body for Life for Women, and Fit to Live. 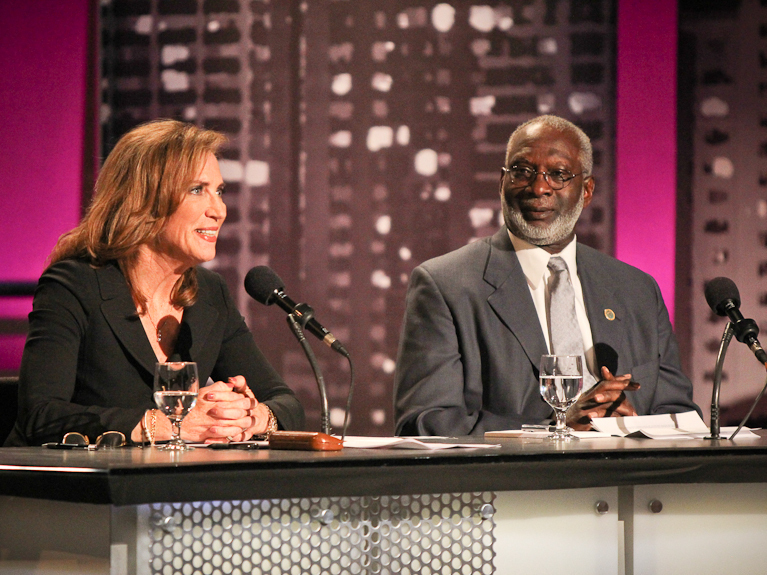 Dr. David Satcher served as the 16th surgeon general of the United States and published America's first "Call to Action to Prevent and Decrease Overweight and Obesity." Formerly a four-star admiral in the U.S. Public Health Service Commissioned Corps and director of the Centers for Disease Control and Prevention, Satcher simultaneously held the positions of surgeon general and assistant secretary for health from February 1998 through January 2001. Satcher is a former Robert Wood Johnson clinical scholar and Macy faculty fellow. He is currently the director of the Satcher Health Leadership Institute at Morehouse School of Medicine. Paul Campos (left), a law professor and author, and John Stossel, host of Stossel on the Fox Business Network, argue that obesity isn't the government's business. Paul Campos is a law professor at the University of Colorado in Boulder and author of The Obesity Myth: Why America's Obsession with Weight is Hazardous to Your Health. Campos has published extensively on the degree to which weight management should be a subject of public health intermediation. His work on this subject has been featured in, among other publications, Scientific American, New Scientist, The New York Times, The New Republic and The Los Angeles Times. John Stossel, the host of Stossel on the Fox Business Network, has received 19 Emmy Awards and has been honored five times for excellence in consumer reporting by the National Press Club. Stossel also appears regularly on Fox News Channel to provide analysis. Prior to joining FBN, Stossel co-anchored ABC's prime-time news magazine show 20/20. Earlier in his career, Stossel served as consumer editor at Good Morning America and as a reporter at WCBS-TV in New York City.